Kristen Chinn, a former trumpet player with the Magic and Phantom Regiment, sent this photo. 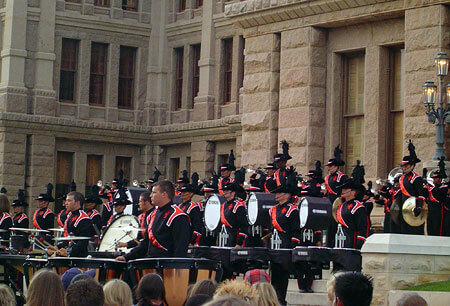 The Crossmen made one of their debut performances on the steps of the Texas capitol in Austin on June 16. They had an amazing sound, and their show music is great! It was so nice to hang out on a beautiful Austin evening with the sun setting and to hear four wonderful groups: the Austin Stars Brass Ensemble, Gulf Coast Sound, Frontier, and of course the Crossmen. Welcome to Texas, guys, and have a great season!